It is now over 13 years since Operation Desert Storm began on January 16, 1991. Given the length of time that has passed, one startling fact is evident in the Desert-Storm Community, there is no single work that provides an accurate day-by-day, hour-by-hour account of Operation Desert-Storm, from the onset of hostilities until the cease-fire declared at Safwan (extensively covered in Ally to Adversary: An Eyewitness Account of Iraq’s Fall from Grace by Rick Francona), until now. 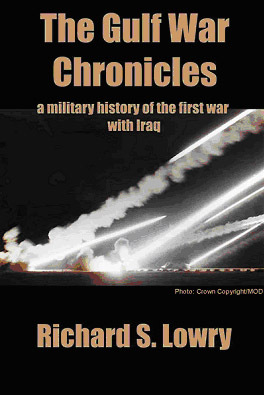 Richard Lowry’s The Gulf War Chronicles strives to fill this void and to do so in detail. Richard has amassed an astounding amount of never before examined information. The author wrote every Commanding General of every major ground unit (that still exists) that participated in Operation Desert Storm. And as it is said, “Ask and ye shall receive”. And receive he did, his requests resulted massive amounts of information. Richard’s initial efforts were started merely as a personal effort to understand the war. With the media reporting “sensational” and conflicting accounts one could easily feel that they were not being given a true picture of the situation as our nation’s soldiers experienced it. The author has combined information from the media, periodicals, books, government reports, and information on the Internet. Over the last 12 years the author has poured over this information to compile a highly detailed, yet quick paced narrative. As one reads this book, they are constantly reminded of the immensely vast scale of the military effort put forth in the Gulf region in 1991. Despite this massive scope, the author smoothly transitions from the large scale to the small scale viewpoints of war. Readers will once again hear the well publicized story of Andy McNab and his wayward patrol. And while this situation is not covered in great detail, this small, yet highly publicized portion of the war to liberate Kuwait, the author consistently weaves together the story of small units, isolated engagements to form that large scale, overall review that has been sorely lacking. I can highly recommend this book to anyone that wants to read a concise, yet information packed account of Operation Desert-Storm, starting from day one and covering all its major events without sacrificing accuracy or discussion of military tactics and methods. The only shortfall in The Gulf War Chronicles would have to be the occasional editorial oversights (misspellings, grammar errors) however these slight blemishes do not in anyway detract from the value of this work. This brings up one thing I would like to point out. This work was published by IUniverse. For those of you that do not know, IUniverse provides individuals an affordable way to publish, market and sell fiction and non-fiction books. IUniverse is one of the largest book publishing companies in the United States. The success of IUniverse has enabled many books that would never have even been written, let alone published by the existing publishing houses, to come into existence. These works are helping to fill the void that has previously been evident in many areas, in particular the history of Operation Desert-Storm. We must credit Richard for making use of all that IUniverse has to offer because The Gulf War Chronicles is a massive step towards the bridging of that informational void. Author Richard Lowry is a member of the Desert-Storm.com Community forums and has agreed to answer any relevant questions posted here in this thread. Please read our quick Q&A below, then feel free to ask! Q: Tell us a little more about yourself. A: I am an entrepreneur, consultant, military historian and an eleventh-generation American. I served in the United States Nuclear Submarine Service during the Vietnam War, and participated in the development of the Apache Helicopter's Night Vision System. My wife and I have lived in Central Florida for the last 22 years. We have three sons who are all attending college. In 2002, I set aside my business holdings and turned to writing full time. I am currently conducting research for my next book, "Marines in the Garden of Eden." I also write for a local magazine: "Metro West Lifestyles." Q: During all your countless hours of research and compilation was there anything that completely suprised you regarding the war? Something you had no inkling you would uncover? A: I would have to say that my greatest surprise was the willingness of officials in the military to provide me with the information I needed for my research. A simple request letter to the commanding general of each of the units involved, yeilded mounds of data and reports. Militarily, I was surprised to discover that the 1st Marine Division assaulted the dreaded "Saddam Line" in southern Kuwait with two infantry regiments, (Task Force Taro and Task Force Grizzley). These two Marine Infantry Regiments attacked the defensive line with only what they could carry on their backs. They had no sophisticated breeching equipment, they had no advanced weapons systems, they had no tanks. They crawled through the trenchlines, minefields, and barbed wire with their rifles, bayonets, and wire cutters. Questions for Mr. RL regarding The Gulf War Chronicles. Can you tell me the name of the Marine who got the first confirmed kill of Gulf War? Is he listed in your book? What was the mission? Which unit did he belong to? Where is he now? Task Force Grizzly Marine Here! We infiltrated the Saddam Line 2 days before the Ground War Began! I just got my copy in the mail yesterday. I can't wait to read it. Richard Lowry is updating the book and including pics he got from some of us here. I wonderif you got an updated version. I will let you know on Friday (we will be out of town for Christmas and will be having our Christmas then). I really want a first edition but I also really want the second edition. grizzly37 wrote: Task Force Grizzly Marine Here! Well, mine is a first edition. I can't wait to read it. I am going to send for a second edition when it comes out so that I can have both of them. Thank you Richard. The second edition of "The Gulf War Chronicles" will be released next week. Unfortunately, there will not be any photos included. I could not round up enough high-quality photos. Some of you sent me pics, but not were high enough resolution for publication. So, the second edition will be pretty much the same as the first. Thank you all for your support in the past. I am currently working on my next book. "New Dawn" will tell the story of the second fight for Fallujah.